A few months ago I began looking for a beefy vehicle to replace by dying Subaru outback. I want a vehicle to take me off-road camping which a lot of enthusiasts have not dubbed "overlanding". 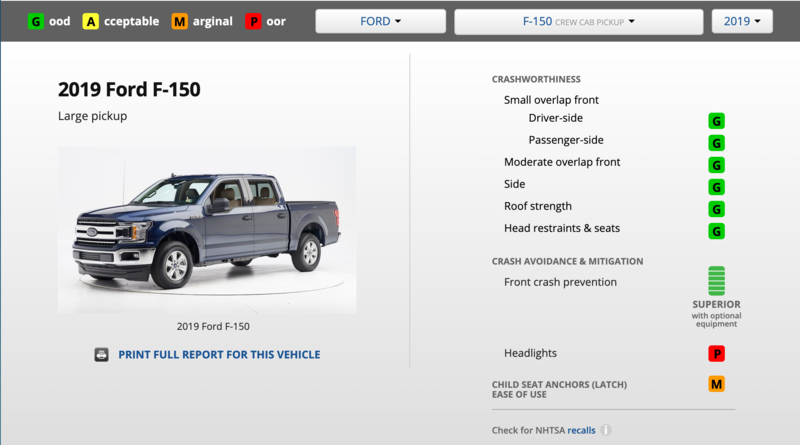 The F150 landed at the top of my list after numerous searches, spreadsheets, and test drives. 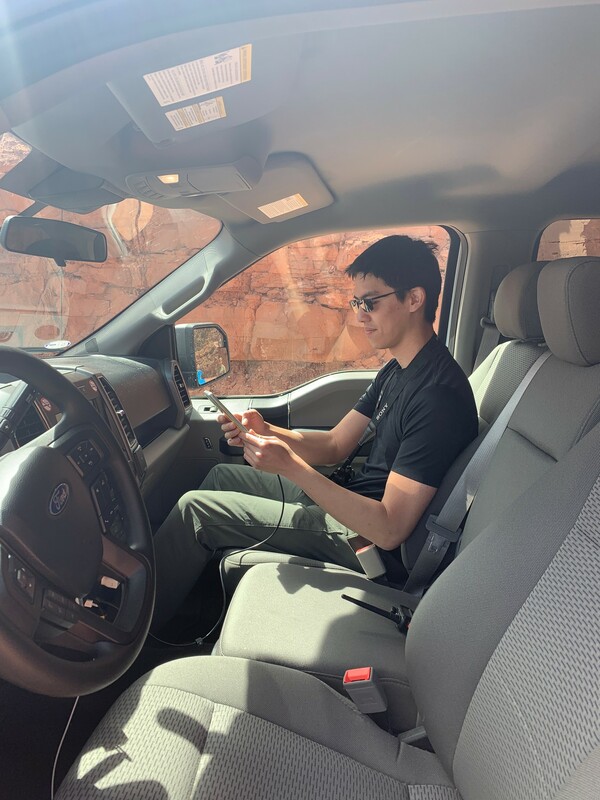 I wanted to further explore the truck, so I rented a 2019 F150 Ecoboost 3.5L 4x4 Supercrew and went to Moab. Here I will distill my experience down into a review. You're probably wondering, why Ford? I was convinced the Wrangler, Tacoma, and 4Runner are the only true offroad overlanding rigs. No one drives an F150 on dirt. It's a contractors truck. Long ago I fell in love with Jeep and Toyota's iconic designs and the adventurous ephemera they built. I owned a 4Runner before my current Outback, and I have friends with Wranglers and Tacomas who I often travel with. All other SUV's and trucks were out of the question. I had to have one of these. 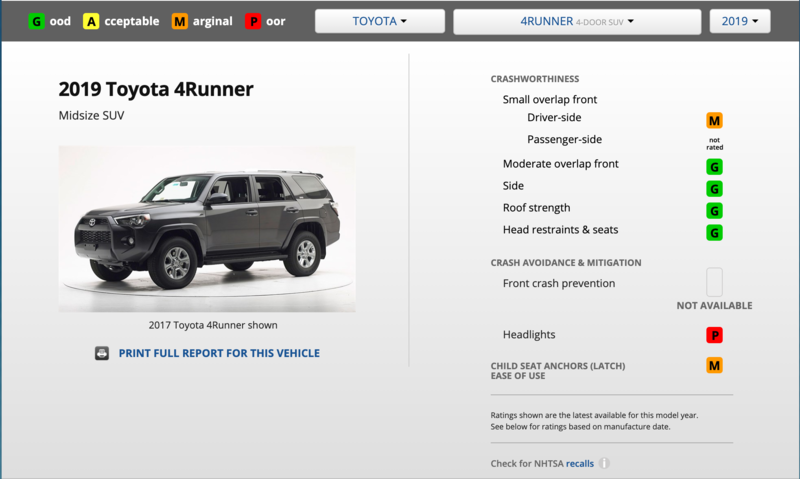 It was only when the compromises I'd have to make with comfort, performance, and safety set in that I realized maybe there's something better than the Jeep and Toyota options. Do they really make the best affordable offroad vehicles? I was victim to great marketing. I put dozens of 4x4 SUV's, trucks, trims and engine variants from all the big auto manufacturers on a spreadsheet, and a properly configured F150 quickly emerged as the best overlanding rig. At least on paper. 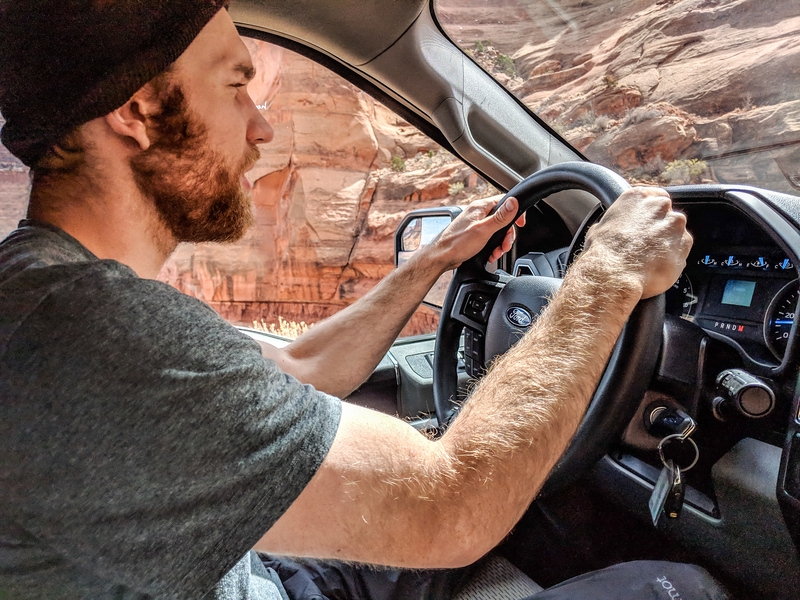 We rented a 2019 F150 Supercrew Cab 4x4 Ecoboost 3.5L engine and took it offroading in Moab, UT. We followed our rental agency's rules. 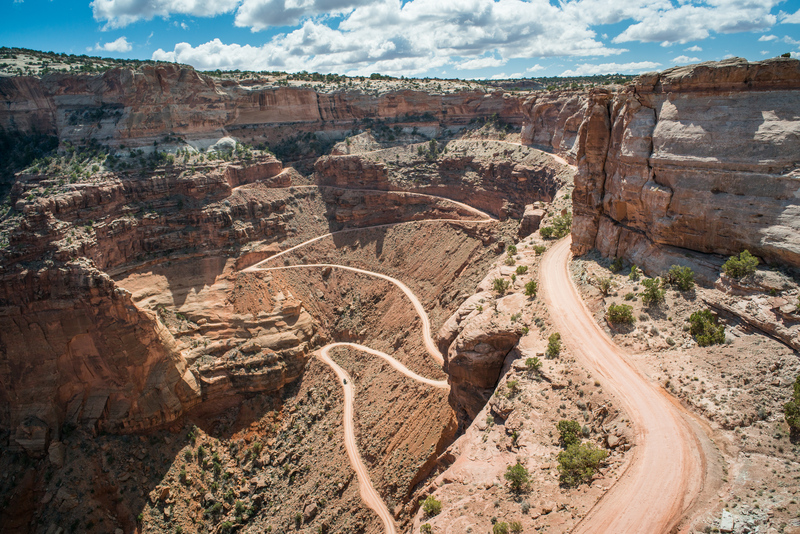 We had permission to take it on US forest service, BLM, and National Park dirt roads, but it wasn't clear if harder Jeep trails Moab is famous for were allowed, so we avoided them. We were also cautious, and traveled with another 4x4 vehicle to avoid expensive recovery towing should anything go wrong. 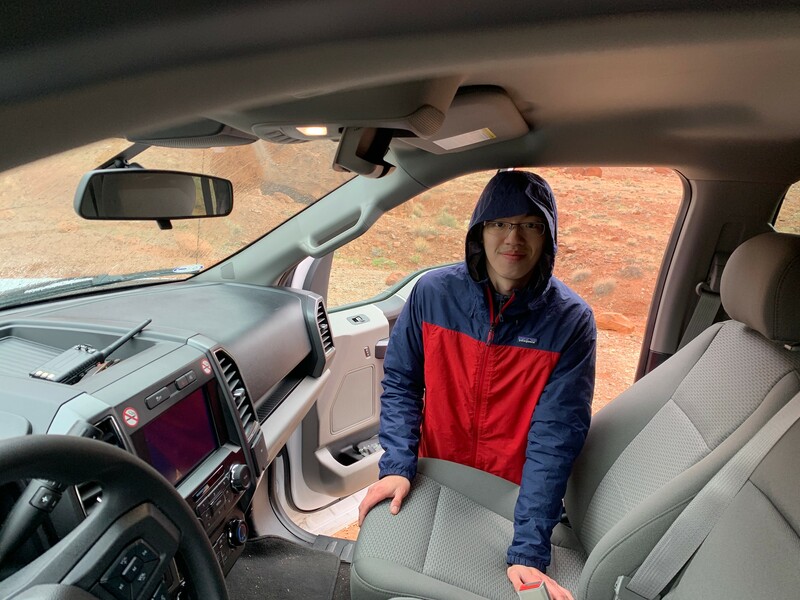 We put it through the paces on Shafer Canyon Trail, high clearance dirt roads of Arches National Park, and numerous poorly maintained BLM roads. My stoke was high for getting in this vehicle, but the experience was dull. Stepping into the bland interior was a bit of a letdown. The cloth seats, bulky design, bland steering column, and grayish tan colors had me confused. 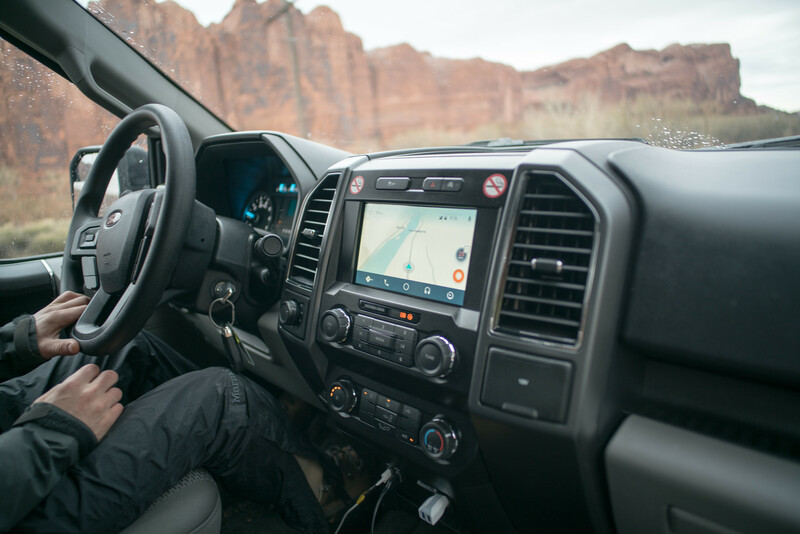 The interior of a 2019 F150 felt as if it could be 2009 F150. Nothing stood out as being new or innovative except the Sync 3 display. 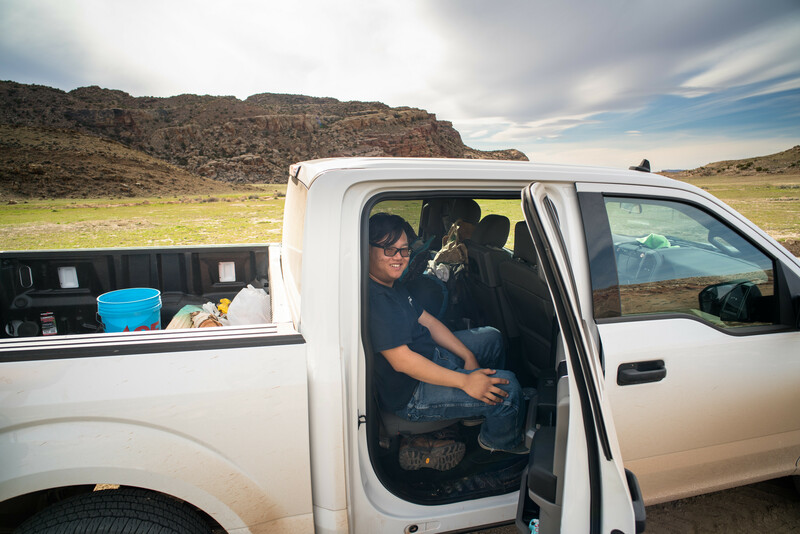 I felt that I was in a work truck, not a cool hip truck to adventure in Moab. But... the throttle brought a smile to my face. I was blown away. I went nowhere on the green light. Pedal to the metal had the tires burning out. Once 4x4 was engaged, I was doing sub 6-second 0-60 mph in Salt Lake City. A mile above sea level where vehicles are sluggish due to reduced oxygen at altitude. How could a tiny 3.5L V6 truck engine pack so much punch? Its high compression turbocharged engine delivers better overall performance than its V8 counterpart, at 375 HP and a whopping 475 ft-lbs torque. The 15 PSI boost at sea levels gives the 10:1 ratio engine an effect compression ration of 20:1, high but just low enough to run on 87 octane. 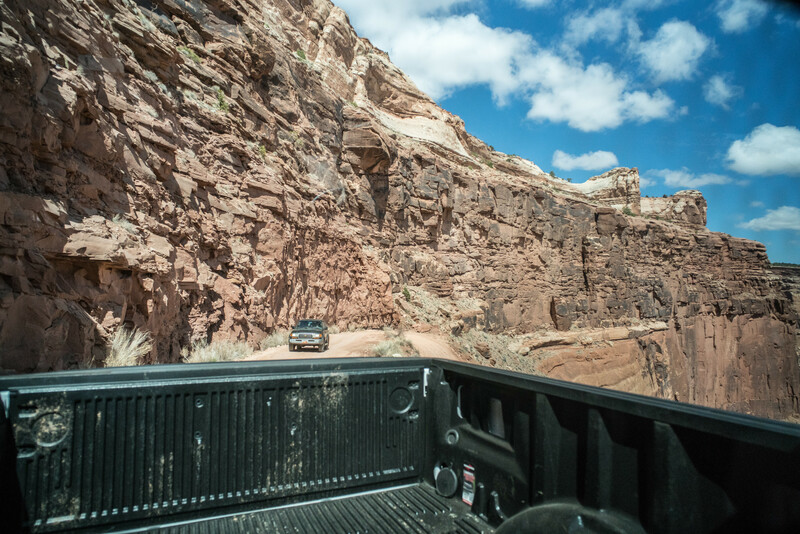 It suffers less powerless at altitude than naturally aspirated engines, which we realized is a big win for climbing steep grades of Moab. The insane torque output of 475 ft-lbs of torque is immensely helpful for many things. It lends itself to high tow capacities, topping out at 13,200 lbs on US roads, but the Ford manual in the glove claims 19,000 lbs towing is possible but is not allowed on the road due to its gross weight rating. In four-wheeling, the crawl ratio is everything. It is all about transferring as much torque as possible to the wheels at low speeds to get over obstacles and safely climb steep grades. And that our F150 did. For every time the wheel turns once, the engine turns 41 times. Here's the calculation. In the 4x4 community, that's a competitive crawl ratio. Stock Toyotas and Jeeps are below 40. Combine that with its best in class 470 ft-lbs of torque, and the torque to wheels in 4-LO blows Jeeps and Toyotas out of the water. This truck had 31-inch tires. 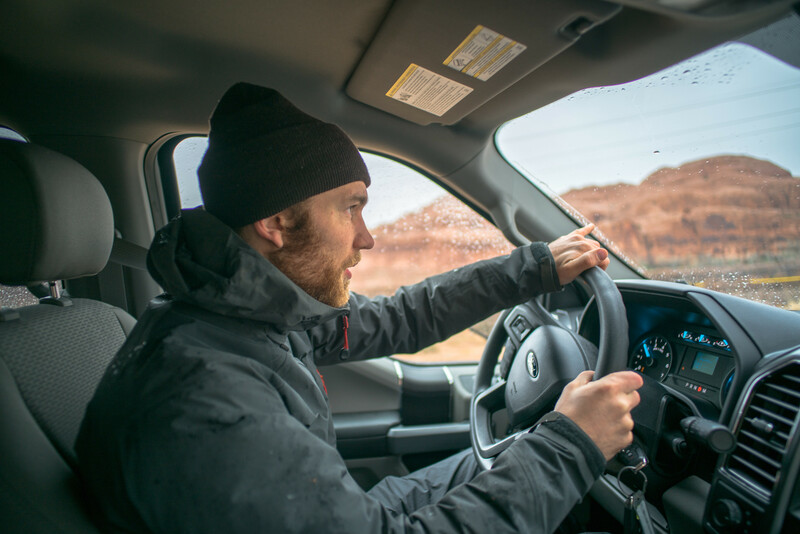 At peak torque RPM, 3500, the truck moves at 11 miles per hour, and delivers 152 ft-lbs of torque per ton, about 40% more than the Tacoma. At 5 miles per hour, it delivers 111 ft-lbs of torque per ton. That's some beastly performance that lends itself to larger tires. If I buy one, I'm putting in 35-inch tires, which it can take stock with a leveling kit. 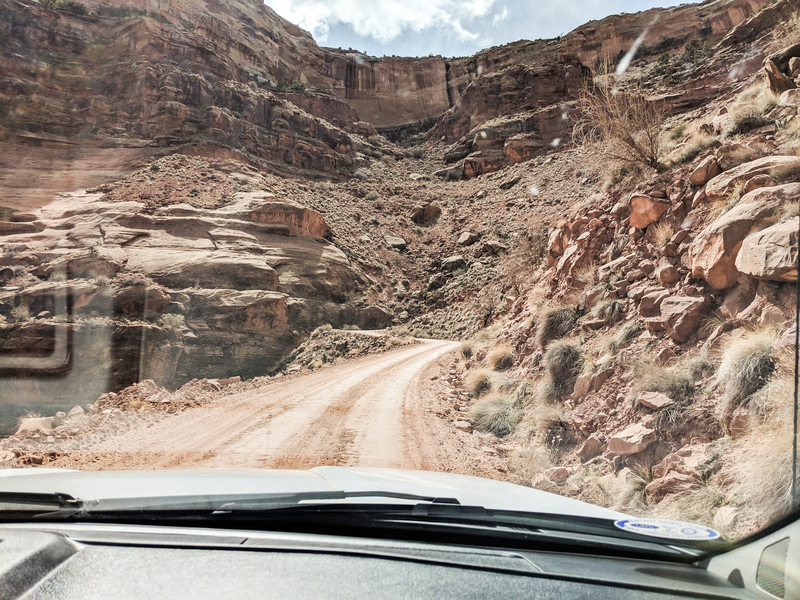 We felt so secure driving up 20-degree switchbacks on Shafter Canyon Trail. The switchbacks were so tight, we even hard to reverse. I'd be shaking in fear doing this in my Subaru, but in the F150, it's no problem starting and stopping on such steep terrain because it delivers so much torque a low speed. We averaged 23.9 MPG on the highway, and 20.9 MPG overall for the 800 miles we drove. I was very surprised how good it was. 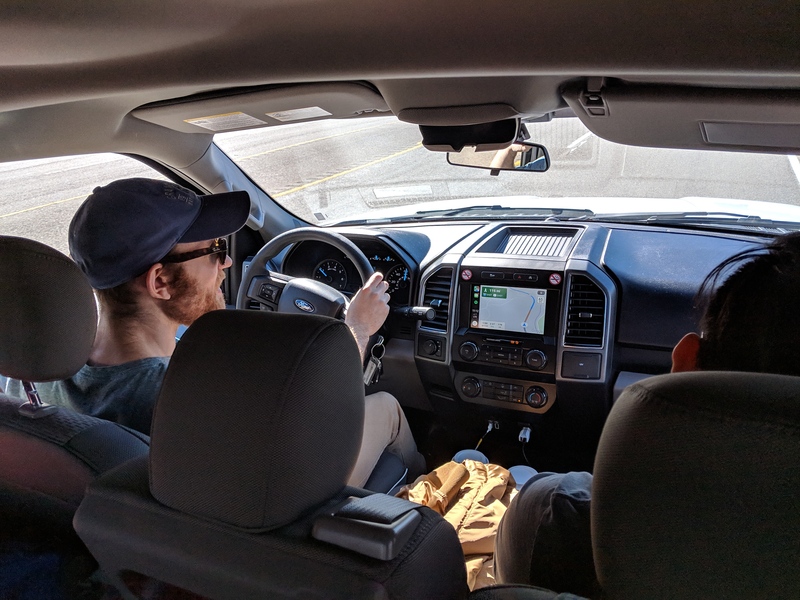 I was thinking we'd get more like 17 MPG average, but we drove 60 MPH on the highway because @mendoza followed us in his landcruiser, and he refuses to take it over 3000 RPM. 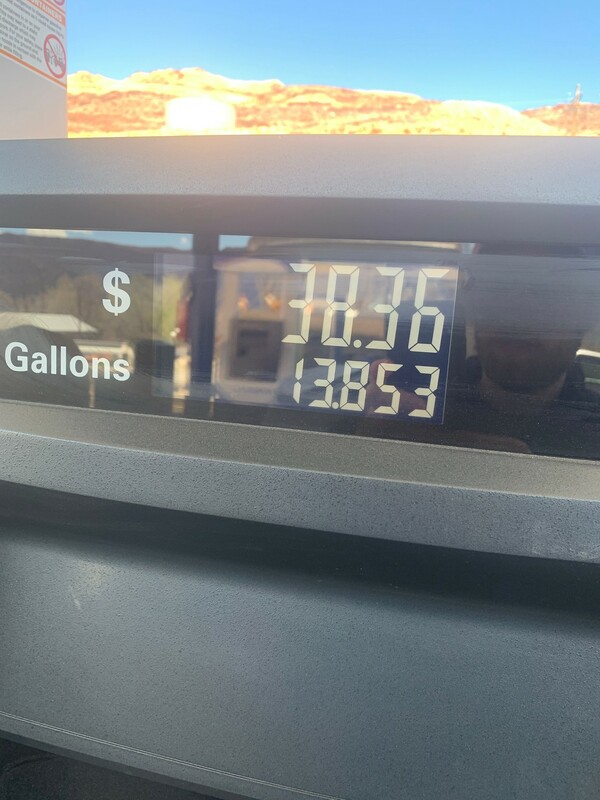 Thanks @mendoza for saving us money at the pump. The much bigger F150 gets the same or better MPG as its smaller competitors for three big reasons. First, the Ecoboost has direct injection which gives more control to how much fuel is put in each cylinder which creates a leaner burn. Second, the Ecoboost turbo allows for a smaller displacement while still providing high HP and Torque output. And third, the F150 is made of an all aluminum body which is much lighter than the other steel-bodied vehicles. The F150 we rented weighed 4917 lbs, while the much smaller Tacoma weighs 4425 lbs. The F150 delivers 20% more horsepower per ton than the Tacoma. Cabin comfort is a big show stopper for me on the 4Runner, Wranger and Tacoma. I rarely travel with less than 3 people and a dog. Sometimes I pack 5 people into my Subaru. It's just not comfortable. Rear legroom is the killer. I thought the Subaru was bad until I saw how it stacked up. 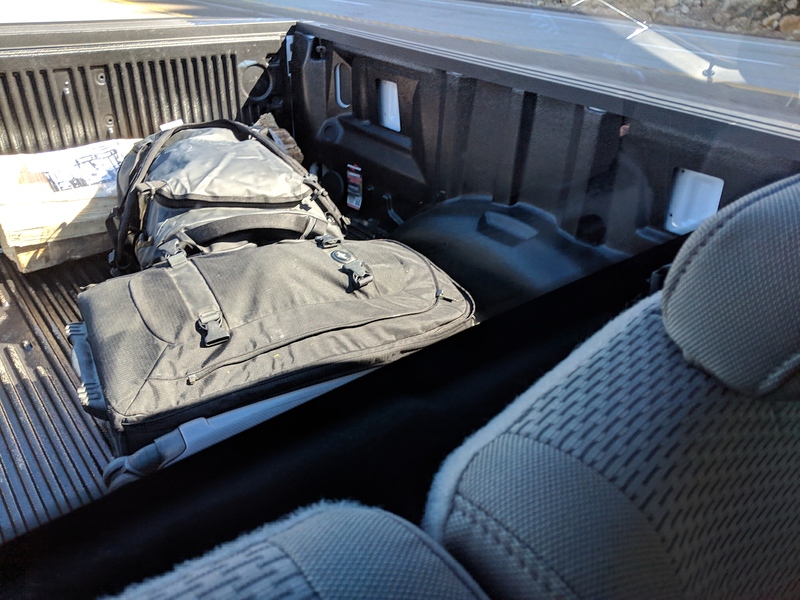 There was so much space back there in the F150. 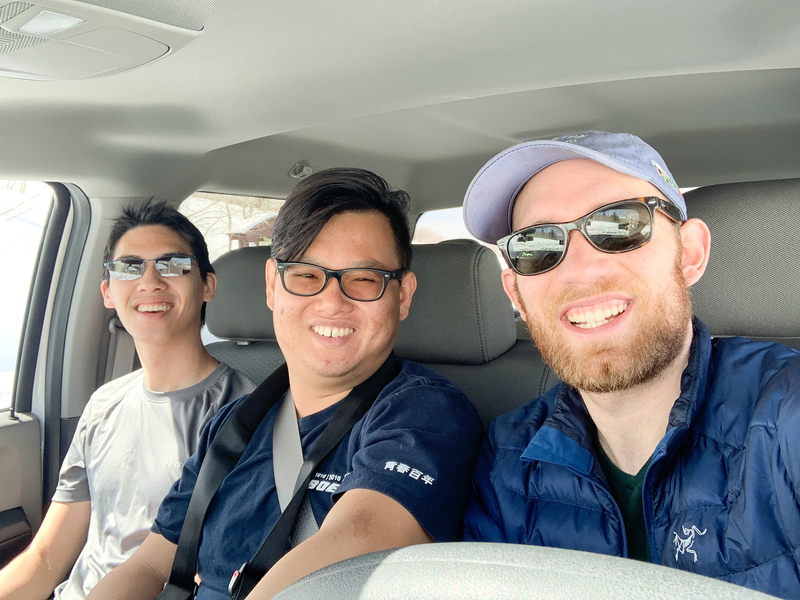 The three of us riding in the F150, @xelanil, @joseph_hsieh and I, switched off sitting in the back. At 6' tall I could completely stretch my legs straight. Hip room, shoulder room, headspace, were also great. The truck is 5 inches wider than a Tacoma. There's spacious void between a shotgun passenger. We all get car sick, so we tried out the font middle seal. To our surprise, it wasn't bad. The big downside is the transmission hump has your knees above your belly button. But it's better far better than a minivan's 3rd row, which got me think who needs an SUV when you have a 6-seater truck cab and a huge bed? Obviously, protecting your cargo from the elements is a battle with an open bed truck. 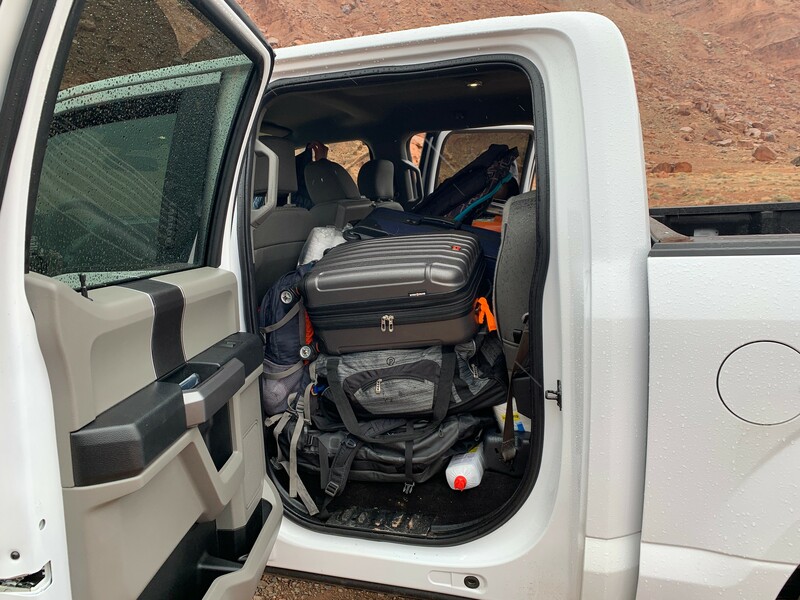 The rental lacked a tonneau cover, so we found ourselves contact moving our cargo between the bed and cab, until we realized @xelanil is a Tetris master who can pack all our gear into the cab, and still have space for the three of us. If I eventually buy a truck, probably the F150, it will be top priority to build a gear management solution. I really like the idea of building truck drawers that pull out. Speaking of gear, payload capacities are often an overlooked spec. Being well under the payload capacity is vastly important for the safety and longevity of the vehicle. This is my primary reason for seeking a beefier vehicle. I'm frequently above the limit of my Subaru Outback. Overloading a vehicle degrades suspension performance, making you more susceptible to roll over. And in crashes, it's far more dangerous because there's more inertia that can force objects through crumple zones. Also with overloaded vehicles, the transmission, brakes, suspension, and even the engine wear our faster. Payload capacities: * Disclaimer payload capacities vary based on individual trims and equipment options. These are the advertised capacities I can find. 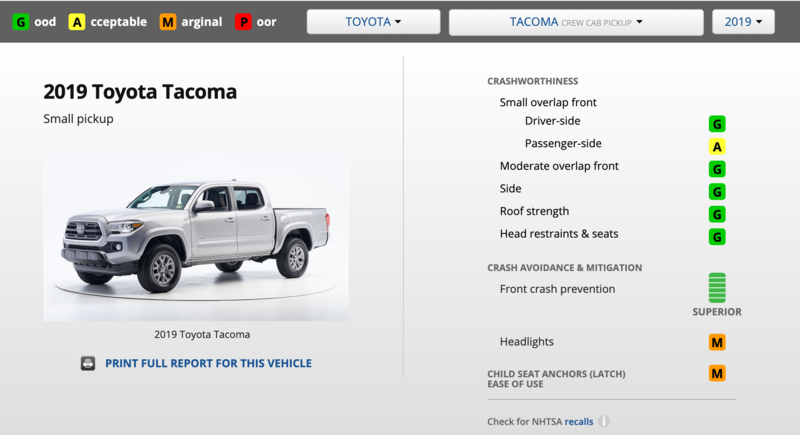 I was so disappointed and surprised that the Tacoma has an even lower payload capacity than my Outback. In my mind, the Tacoma is a less comfortable outback. The F150 far surpasses all other light truck and SUVs on the market. Wow...xlt report Kevin on so many levels...and, Moab is the Blue Ribbon of testing grounds, even for non-radical 4x4 riding. My stoke was high for getting in this vehicle, but the experience was dull. I love your opening line....and, relate. I love to get weak knees with a rig, but, maybe features trump that in the long run. Thanks for the report.....I am rarely more than ONE, so this is too much rig for me but your engineering analytics indicate that the Ranger might be a good alternative for my lifestyle.